DOTD has been shrinking signs for the last 5 years. Distance signs on 2-lane roads are in print so small they are hard to read at 55 mph. I noticed an overhead cantilever sign on I-10 EB at LA 49/Williams in Kenner has been taken down and replaced with a smaller sign on the pole. That cantilever sign appeared to be leaning prior to its removal. If I had to guess, all of the overhead signs that were taken down were due to structural issues that could not wait for a sign replacement project. 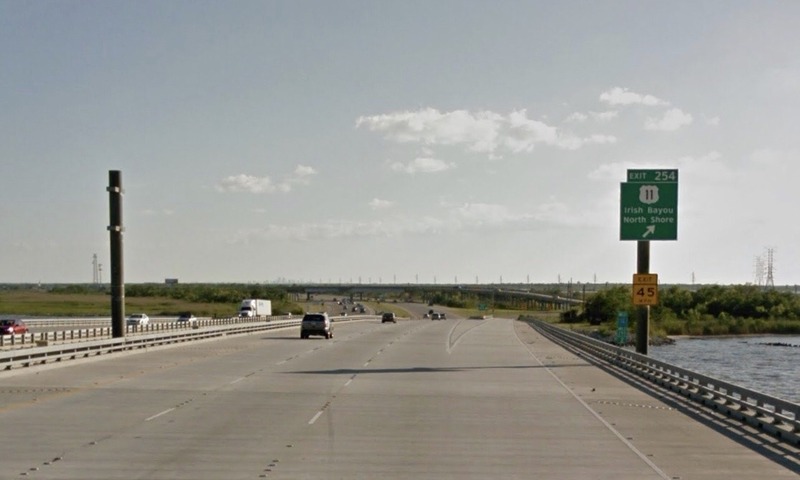 The size of the replacement signs may have been based on the pole's load capacity, which does not appear to be sufficient for a interstate standard sign. I've noticed this year, particularly in the New Orleans area, that there are at least 3 spots where overhead pantries and pull through signs have come down (or were never finished being installed) and been replaced with the GDOT style side post mounted guide sign. The difference however, is that the LaDOTD signage is scaled down significantly compared the original signage and is hard to read until you're up close. These have replaced pull throughs at the split from the 310 northbound to the I-10, and on the I-10 eastbound approaching Loyola Dr. There are some in each direction of the Twin Span as well where the trusses were never installed into the supports to complete the gantries. I recall seeing this in Baton Rouge as well, but I don't remember where? That would make sense. They could be operating on a queue of gantry replacement projects. They just finished replacing the gantries at I-12/I-55. Test pilings for the upcoming shoulder project on the Causeway Bridge will start in mid-July. Actual construction is to start in the fall. Found a nice video of the construction of the Atchafalaya Swamp Bridge by the then-Louisiana Department of Highways. I take it Louisiana doesn't keep records of pile driving data from previous projects? They may. But also consider it's been several decades since those existing pilings were made and the lake bottom may well have changed some. Undercurrents certainly would have been affected by the pilings for the existing bridge. Yeah, I noticed a few more have come down in the N.O. area. Saw them taking down one on the Carrollton overpass. Add another missing on I-20 WB in Shreveport: exit 18D Common St/ Louisiana Ave.
DOTD has asked for proposal requests from contractor finalists for the I-10/Loyola Drive interchange in Kenner, one week after proposal requests for the I-20/I-220 revamp and new road to Barksdale AFB. Plus, bids were let June 27 for various projects around the state. This will include the states first DDI. I’m looking forward to seeing how this thing will look under the Jefferson Parish/Kenner style of signage, stripping, and signaling. That’s assuming that DOTD doesn’t completely ignore local aesthetics as they’ve been doing with their signal replacements in Orleans Parish. It’s just atrocious. I would love to be there at one of those meetings (DOTD press release). Baton Rouge, La. - The Louisiana Department of Transportation and Development will hold three public meetings to gather public input regarding the proposed improvements along I-10 from LA 415 in Port Allen to Essen Lane in Baton Rouge. July 11 announcement of statewide project bids. BATON ROUGE – The Louisiana Department of Transportation and Development (DOTD) announced today that 22 projects around the state were let on July 11, 2018. Nineteen contractors presented bids totaling $59.4 million. Construction projects are prioritized by road/bridge condition, urgency of improvements, type/volume of traffic, crash records, unforeseeable emergencies that caused damage, and several other factors. For more information about these projects, please visit www.dotd.la.gov. ...as Great Anticipation Revenue Vehicle Bonds. The state gets a $45 million grant that will go toward the replacement of the Belle Chasse Bridge and Tunnel. LADOTD just announced dates for public meetings on the proposed upgrade to the Loyola Avenue/I-10 interchange in New Orleans. This is to add new direct connection ramps to the realigned access road to the soon to be constructed terminal at Louis Armstrong/New Orleans International Airport, and to improve capacity overall to Loyola Avenue. All of the options would have direct connection flyovers from/to I-10 east to the new "Satchmo/NOLA" terminal that would use the Loyola ROW, and pass over the intersection of Loyola and Veterans Memorial Drive (the same concept used for the existing access road at Williams Boulevard). 3) Converting the existing Loyola interchange to a DDI (Diverging Diamond Interchange). The project is being designed and built as a Design/Build project, and is fully funded off state funds and a GARVEE grant from the USDOT. It may not seem like much of a park, but I can see the Federal agencies pushing Alt I because of Section 104(f) impacts. Or LaDOTD might be told to go back to the drawing board and come up with an alternative that doesn't impact the park at all. But I think Alt I is more likely. The new terminal should be done by spring of next year. I doubt the new access road will be done in time. DOTD has put a basic concept of the I-10 widening project in Baton Rouge on its web site. Based on what I'm seeing, there would be NO work done to the main span of the Wilkinson Bridge. A lane would be added in each direction except on the UPSLOPE of the Wilkinson Bridge, where I-10 would actually lose a lane until it is joined by the on-ramp from La. 1. I-10 would be four lanes in each direction from the 10-110 split to College, five lanes from College to the 10-12 split and three lanes elsewhere. DOTD also had a concept for combining the Dalrymple/Washington interchanges and a new design for College Drive. Alternate I is preferred by mostly everyone at this point because it requires the least amount of ROW, even though alt L is cheaper. Most of the general concerns expressed by the the Susan Park community were in regard to the fire station relocation and permanent closures of 27th street sections. Very few, if any, people were concerned about the park itself. The second public meeting is tomorrow so I guess we’ll see what happens tomorrow. They couldn't possibly have the foresight to furnish a road to get to the new terminal. They'll have it open, and nobody will be there to board the planes, and they'll wonder why. Let’s just say that the State completely dropped the ball when it came to their portion of this project and now DOTD is making life hell for everyone involved to cover their ineptitude. I-10/Loyola/Vets is going to be a cluster**** for a few years. That’s all I got. Maybe I'm obtuse, but I'm not seeing how 6,048 feet of shoulder (in six sections) is going to make a great difference on a 23 mile long bridge.